Part of my dad's Christmas gift one year for his office since he is an optometrist! My family and I often talk about the importance of good vision. We talk about what would be the worst sense to lose and we all agreed on vision. Taking care of your eye health is important in helping to prevent some eye problems. I do not have vision issues but my husband does. Nighttime driving is a bit more difficult for him than during the day but especially when it is raining. For some reason, he has a really hard time seeing when it is raining. My grandma who is 86 years old still drives but has a really hard time driving in the dark. In fact, a lot of times, if we have events later in the evening, she won't come because it is hard to drive in the dark. With daylight savings time, unfortunately, it gets dark so much earlier and therefore, many of us have to drive in the dark. When it is getting dark around 5 PM, many people are still at work or coming home from work. 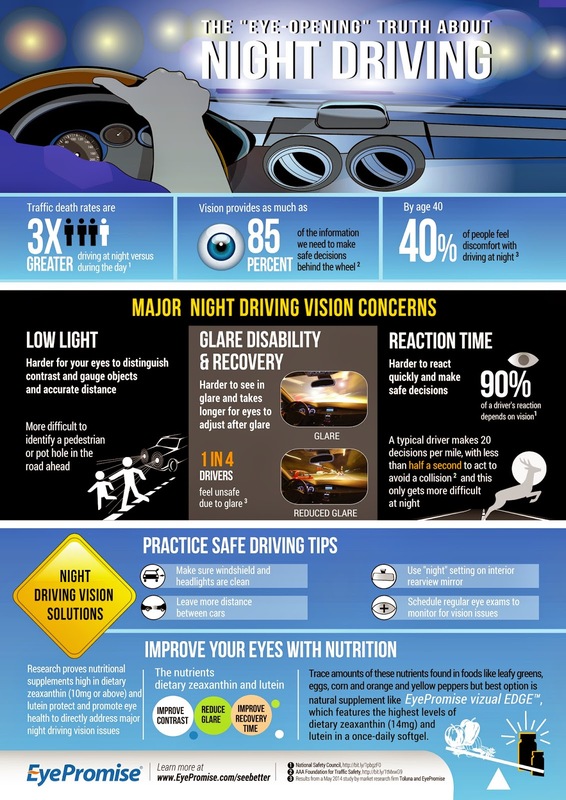 It is important to take proper precautions for night driving if you have vision issues. Vision has a role in low-light conditions and glare limits the ability to see at night. A recent survey showed that 40% of people over age 40 are anxious driving at night and 1/4 of drivers feel unsafe due to glare. It is not only unsafe for the driver but also for everyone on the road. There can be issues with low light which is harder for your eyes to contrast objects, glare issues and slowed reaction time. Also, driving at night can be a concern because traffic death rates are three times higher with driving at night than during the day. EyePromise is a line of nutrition supplements that contains vitamins and minerals that may play a role in supporting eye health. EyePromise Vizual Edge contains zeaxanthin and lutein which may help your eyes see better and react faster with driving at night for those that are not getting enough of these nutrients. These are carotenoids that make up the macular pigment in the eye to protect vision. These nutrients can also be found in corn, leafy greens, bell peppers and eggs. What I like about these is that they have most vitamins and minerals so you could take it instead of a multivitamin. Also, most of the percent daily values are at 100% or less which is good because some supplements contain like 800% of your daily required vitamins which may be too much for your body and can pose negative effects. The giveaway will be for three Night Driving Confidence kits which come with a flashlight, headlight/windshield cleaning cloth, a coupon for EyePromise and other items.